Several EU projects funded during the FP7 programme and currently under the topic ‘Blue Growth’ of Horizon 2020 aim at improving the exploitation of marine organisms for several biotechnological applications (e.g. pharmaceutical, nutraceutical, cosmeceutical, bioenergy and other industrial applications). Here we focus only on those related to marine drug discovery such as BAMMBO, BlueGenics, GIAVAP, LIPOYEASTS, MaCuMBA, MAMBA, MAREX, MarineBiotech, PharmaSea, PolyModE, SeaBioTech, SUNBIOPATH, EMBRIC, INMARE, NoMorFilm and TASCMAR. We describe the major achievements in this field in terms of improved sampling in extreme environments, optimization in cultivation methods with the creation of ad hoc systems and bioreactors/raceway ponds, speeding up the production of a specific product by genetically modifying microorganisms and sequencing genomes/transcriptomes of marine species in order to identify enzymes of industrial interest or gene clusters responsible for the synthesis of bioactives. Several enzymes and new metabolites have been found allowing for important discoveries and new products for development in different market sectors: health, personal care, cosmetics and nutrition. We also discuss the urgent need to find new funding opportunities in H2020 that will allow candidate lead compounds identified by these projects to advance to preclinical testing in order to assess chemical, biological and toxicological properties. 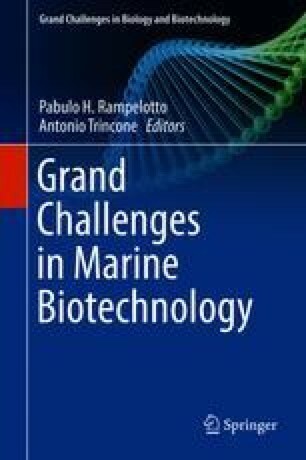 Overcoming these difficulties would allow marine drug discovery to reach its full potential, thereby supporting the development of blue biotechnology in Europe. We thank Flora Palumbo from Stazione Zoologica Anton Dohrn for the graphics.